Without much fanfare, Apple has updated its iMac line with Haswell chips from Intel along with a few other new goodies. Apple promised that it had a lot of plans for the fall, and it looks like it's carrying through with those plans. With no advance word, and just a press release this morning, Apple has updated the popular line of iMac desktops with Intel's Haswell chips. Additionally there are some other nice updates such as support for 802.11ac Wi-Fi, and the speed of the PCIe flash storage has been increased. The graphics cards have also received an update depending on the model you select, but the high-end 27-inch model now has the option of coming with a NVIDIA GeForce GTX 780M with 4GB of GDDR5 memory. We're not quite sure what your average user would be working on that you need that much, but it does sound awesome. The new iMacs are available now with shipping beginning immediately. CUPERTINO, California—September 24, 2013—Apple® today updated iMac® with fourth generation Intel quad-core processors, new graphics, next generation Wi-Fi and faster PCIe flash storage options. The updated iMac brings the latest technology to the stunningly thin design and gorgeous display of the world's leading all-in-one desktop. "iMac continues to be the example that proves how beautiful, fast and fun a desktop computer can be," said Philip Schiller, Apple's senior vice president of Worldwide Marketing. "Inside its ultra-thin aluminum enclosure, the new iMac has the latest Intel processors, faster graphics, next generation 802.11ac Wi-Fi and faster PCIe flash storage." Continuing Apple's commitment to energy efficiency and the environment, iMac meets stringent Energy Star 5.2 requirements and achieves an EPEAT Gold rating. 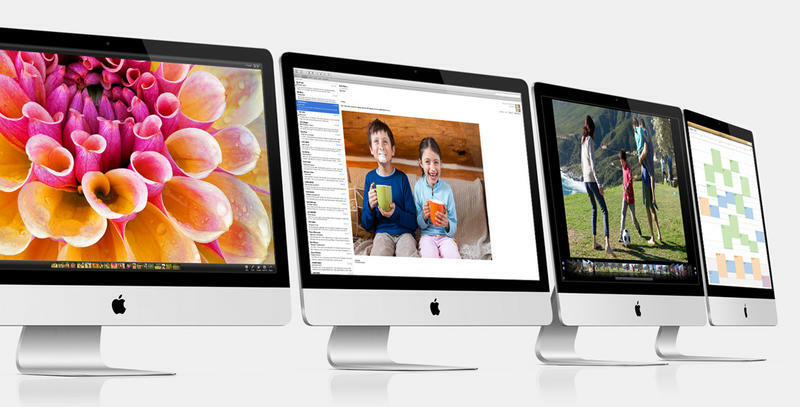 ** iMac features LED-backlit displays that are mercury-free and made with arsenic-free glass. iMac includes PVC-free components and cables, contains no brominated flame retardants, and uses highly recyclable materials and material-efficient packaging designs. The new iMac is available today through the Apple Online Store (www.apple.com), Apple's retail stores and select Apple Authorized Resellers. The 21.5-inch iMac is available with a 2.7 GHz quad-core Intel Core i5 with Turbo Boost speeds up to 3.2 GHz and Intel Iris Pro for a suggested retail price of $1,299 (US); and with a 2.9 GHz quad-core Intel Core i5 with Turbo Boost speeds up to 3.6 GHz and NVIDIA GeForce GT 750M for a suggested retail price of $1,499 (US). The 27-inch iMac is available with a 3.2 GHz quad-core Intel Core i5 with Turbo Boost speeds up to 3.6 GHz and NVIDIA GeForce GTX 755M for a suggested retail price of $1,799 (US); and with a 3.4 GHz quad-core Intel Core i5 with Turbo Boost speeds up to 3.8 GHz and NVIDIA GeForce GTX 775M for a suggested retail price of $1,999 (US). Additional technical specifications, configure-to-order options and accessories are available online at www.apple.com/imac.